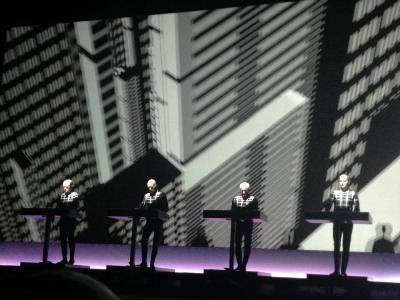 There is hardly a person who loves electronic music or any kind of music growing up in the 80s that would not cite Kraftwerk as a formative influence on their musical tastes. The band, formed in 1970 by Ralf Hutter has contributed a legacy to electronic music that remains unparalleled. So it was with great excitement that CGNY set out to see them (for the first time) at the United Palace Theater in uptown Manhattan last night. The venue, part of the United Palace Cathedral is a sprawling, ornate space. Intricate designs on the ceiling and cornices make you feel like you are stepping back in time – which in a way, going to hear some old school electronic music, you are! We had prime seats - 3rd row orchestra center. I knew I was in for a good time when the attendant handed me a set of 3D glasses! The show (with no openers) kicked off about 8pm The curtains peeled back to the reveal the iconic four in form-fitting lycra suits, patterned with lines that appeared to light up throughout the show! A spellbound audience inhaled audibly when the first 3D effects started to reach out into the crowd as The Robots began to play. What followed for the next almost 2 hours (and it flew by) was a journey through lush electronic landscapes. They played all their most popular numbers, Computer World, Autobahn, Trans Europe Express, The Model (in German), all accompanied by amazing yet simple 3D graphics. Some highlights were the virtual drives during Tour de France and Autobahn. It definitely felt completely immersive and “Tron-like”! The players themselves, in keeping with their stark performance style displayed little emotion except for some toe-tapping during some of the dancier pieces. All the emotions were conveyed in the music. Hard to believe that some of these pieces were created over 40 years ago. There is no doubt that their brand of electronic music can hold its own with classical music of any style. Each of their pieces sounded as fresh and interesting as when they were first made. One of their final pieces acknowledged the strong connection between techno from Detroit and Germany: “Detroit is electro, Germany is electro” flashing across the screen. With a double encore and standing ovations, these acoustical astronauts took us on a beautiful electrifying journey that lifted the spirits and cemented Kraftwerk as one of the best musical acts around, electronic or otherwise and certainly worth catching any time you get the chance. Check them out at Moogfest!